With so many uninsured Americans out there, I always think there’s a great opportunity to sell protection-based products. My rational brain reminds me that not everyone is insurable. But don’t let that stop you. Too often, planners give up when they can’t secure life or long-term care insurance for their clients. Don’t forget to look at other insurance-based options. Annuities can provide some of the protection your clients need when insurance coverage cannot be secured through underwriting. Many income riders provide ancillary benefits, including death benefits and long-term care coverage. Of course, there is an additional cost for these optional features. But, even with the additional cost, these riders could be a good option for people who could not otherwise enjoy the protection of a death benefit or long-term care coverage due to their health conditions. We’ve previously explained how you can use annuities to not only pass along family wealth, but also pass along family values. When you attach your planning to your client’s values and not just their wealth, you create a stickiness that can’t be beat by any competitor. You might not create as large of an estate as you’d be able to with life insurance, but you can help the family control the disbursement of wealth. In the end, proper estate planning is getting the right asset to the right person at the right time. Remember, long term care is more of a cash flow issue than a capital issue. Many income riders have an enhanced feature – for some additional cost – to increase the benefit base or payout rate for long-term care events. Again, it’s not going to be as good as a traditional or asset-based long-term care plan. However, it will provide improved cash flow. Because annuities provide valuable benefits in a cost-effective manner, they can be a vital part of your clients’ overall protection plans. When they can’t secure the insurance coverage they need through underwriting, look to annuities to fill some of the gap. 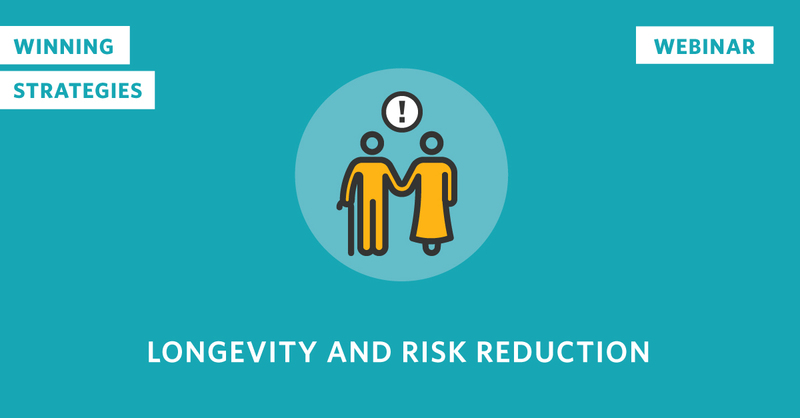 As our population continues to age, risks increase due to longevity. And, longevity is the greatest multiplier of all the retirement risks. We were joined by Tim Ash to tackle these risks and offer solutions. Planning for retirement and protecting a client’s legacy go hand-in-hand. You cannot pass along family wealth without adequate life insurance planning. And, your client will not be able to sustain a standard of living without proper longevity planning. A retiree who lives off a systematic withdrawal strategy risks the chance of eroding their family’s wealth due to longevity-related issues. They might live beyond their planned life expectancy and need more income. There’s also a high chance of needing long-term care – a single event may cost several hundreds of thousands of dollars and wipe out anything to pass along to children or grandchildren. Strategies exist to both maximize your client’s retirement income and protect their family members using life insurance and lifetime annuities or pensions. At the end of the day, it just requires planning and preparation. Make the most of guaranteed income. Guaranteed income comes in many forms. I’m not just talking about annuities. Social Security and employer-provided pension plans are also sources of guaranteed income. It’s critical that you help your clients maximize each by carefully weighing their options. There’s no one-size-fits-all strategy. By maximizing income from these guaranteed sources, you’re lessening the burden on other assets to perform. Approach prospects earlier. Too often, I hear wholesalers and advisors talking about the right client to approach for retirement planning – they usually say late 50s or early 60s. In today’s economic environment, I think it’s younger than that. Americans’ retirement savings rate remains dangerously low. That has to change through education with advisors. The sooner you can get clients on the right track, the better. They’ll have more assets to work with, giving them more options for how – and when – they want to retire or pass on their wealth. Use non-correlated assets. Our studies have shown that withdrawal strategies using a non-correlated asset reduced the failure rate of retirement plans to just 2 percent – compared to 25 percent with a systematic withdrawal strategy.1 I think all your clients would appreciate increased confidence that their retirement and legacy plans will work. Use guaranteed income properly and in conjunction with life insurance to create holistic financial plans. Protect your client’s retirement income and their legacy at the same time. If you were to name the most discussed but underutilized idea in the life insurance industry, I think it would be the annuity arbitrage. In essence, you purchase an immediate annuity and use the payout to purchase another product, like life insurance or long-term care. In today’s low-interest-rate environment, using nonqualified assets to purchase an immediate annuity provides the highest exclusion ratio we’ve seen in decades. The payout, which is heavy in tax-free income, allows the client to purchase more protection because more income is after tax. Also, the higher tax-free ratio affects government thresholds for Social Security and Medicare Part B less than other income-yielding instruments. Lower Medicare premiums could save clients in the middle-income brackets thousands of dollars. Many people believe low interest rates create a low payout, so they are waiting for interest rates to rise. This is a myth that will cost many Americans millions of dollars of income over their lifetimes. Interest rates make up only a small fraction of an annuity payout, with the majority of the payout being mortality credits. As your clients live longer, their mortality credits will decrease, making for longer, smaller payouts on immediate annuities. The cost of insurance will not get less expensive as clients get older. They will get less healthy and have fewer years to live. So, now is the perfect time to capture and lock in the costs of life or long-term care insurance. Not to mention, the cash value inside life insurance can be enhanced with the lowest possible cost of insurance. So, securing insurance now is the best option for future leverage. At the end of the day, annuity arbitrage makes sense in many situations – not all situations. We have a lot of assets on the books of insurance carriers that aren’t being used for their full purpose. I encourage you to evaluate your book of business to see if there are assets available to pay for protection products in an efficient manner. Look to understand the value of annuitization in today’s environment. Avoid the myths and focus on the facts.